With the start of the new year, it’s time to resume blogging. Last year was not an epic year for the blog, though we had some good moments. To kick the new year off, I decided (B actually told me) to change the theme. We’ll see if this one has legs. I also realized that probably the very first cocktail I found to make for B hadn’t been blogged about, a Satan’s Whiskers. I first ran across this one on Robert Hess’ DrinkBoy.com site. He subsequently made a video as part of his Cocktail Spirit series for SmallScreenNetwork. At some point (can’t remember exactly where) I ran across a quote of him saying something to the effect that the Satan’s Whiskers is a great cocktail to introduce people to real cocktails who aren’t familiar with them. 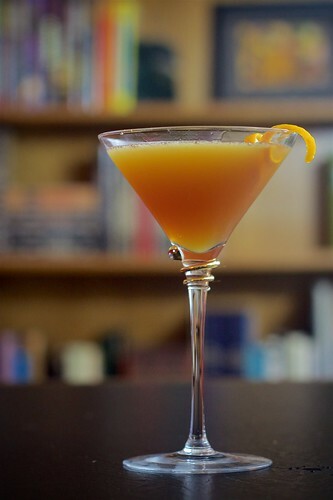 It’s quite a bit of complexity balanced with a hint of sweetness from the orange juice so that it doesn’t put people off the way other cocktails might. It’s definitely good enough that every once in a while we still get a yen for one. The Satan’s Whiskers is included in the 1930’s reprint of the Savoy cocktail book that I have, so it’s a least that old. Other than that, I don’t have a lot of backstory on it. Gary Regan did a nice write up on it for the San Francisco Chronicle, though. It’s also interesting in that it requires orange bitters, which now easily obtained, was until recently unavailable. Here’s to an entirely enjoyable new year.